This is the latest I Ching commentary video, a companion to the material in The Magician's I Ching. There is additional video and text commentary available to members of the Yi Fa Society for every hexagram. If you are interested in joining the Yi Fa Society, please contact me here or on Facebook! Check out the channel for more videos on the Yi Fa Society, the I Ching, and Yi Fa Qi Gong! And if you are interested in joining the Yi Fa Society, please contact me for an application. 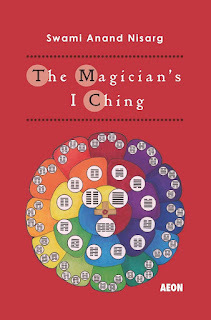 The Magician's I Ching Facebook Group now has Over 1600 Members! 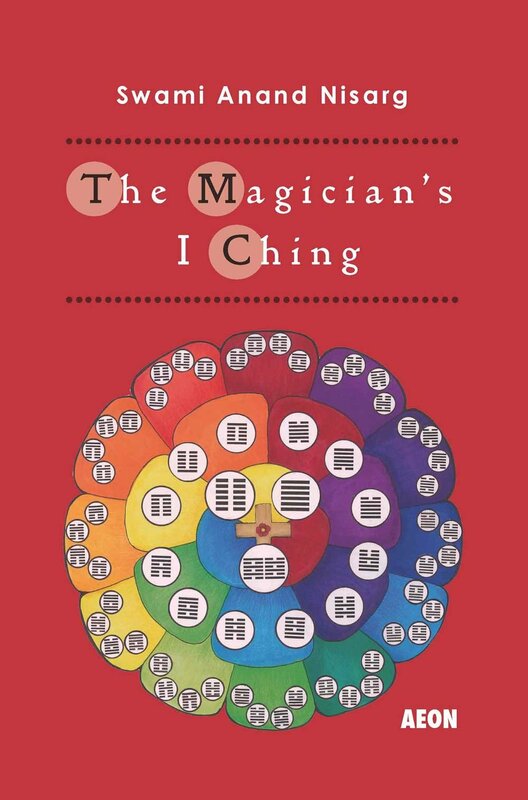 The Facebook group created in honor of The Magician's I Ching, but which is a general discussion group for all I Ching related subjects, has now reached just over 1600 members! the back is firm while the rest of the body is relaxed and fluid. first exercise, where that flowing tension is applied). Thus in every detail your body is expressing Yin and Yang at the same time. If you are interested in joining the Yi Fa Society and working through it's curriculum, please contact me. We ALL have moments where we hunker down and become reluctant to engage in our daily practice of Qi Gong and meditation. The question, and the difference, is what we do after that. There's two (not incompatible) ways of handling this. The first is to try to reconnect to the joy of doing the practice. The practice can't feel great ALL the time, but we should in general be able to find things that feel good about practicing. So one step is to focus on the parts or the ways the practice feels good. When we're very ill, for example, it's good to do as much as we can of the practice while ill, but not too much more than it could either harm us or sour us to the practice. When we are for non-physical reasons in a state of malaise, it can be good to figure out and remember those things we like most about practicing, and give ourselves permission to just do those for a few days, to focus on improving those parts. To ignore or de-emphasize the parts we think we don't care for and spend more time focusing on the parts we do. You could say that's the Yin way. The second way is to focus on Discipline, and push ourselves forward to practice. To defy our own Inferior Person and take our practice as an act of our own Will to defy what we might happen to be feeling at the given moment. Doing that first, we can start to turn around and find value in our practicing, and then reconnect to the joy of practicing. You could say that's the Yang way. The ideal is to be clear on which way to deal with the barriers to our practice at this given time. Hexagram #1 and Hexagram #2 are the two extremes of Reality. Hexagrams #63 and #64 are where those extremes meet. All other hexagrams have one of these four as their nuclear; or as the nuclear of their nuclear. #1 and #2 are both nuclears of themselves; hence they are two polar extremes. #63 and #64 are nuclears of each other; hence, they are the center-point where Time and Space collide. To understand the King Wen sequence (the regular sequence of Hexagrams as they appear in the I Ching) you must think of it as a U-shaped track. 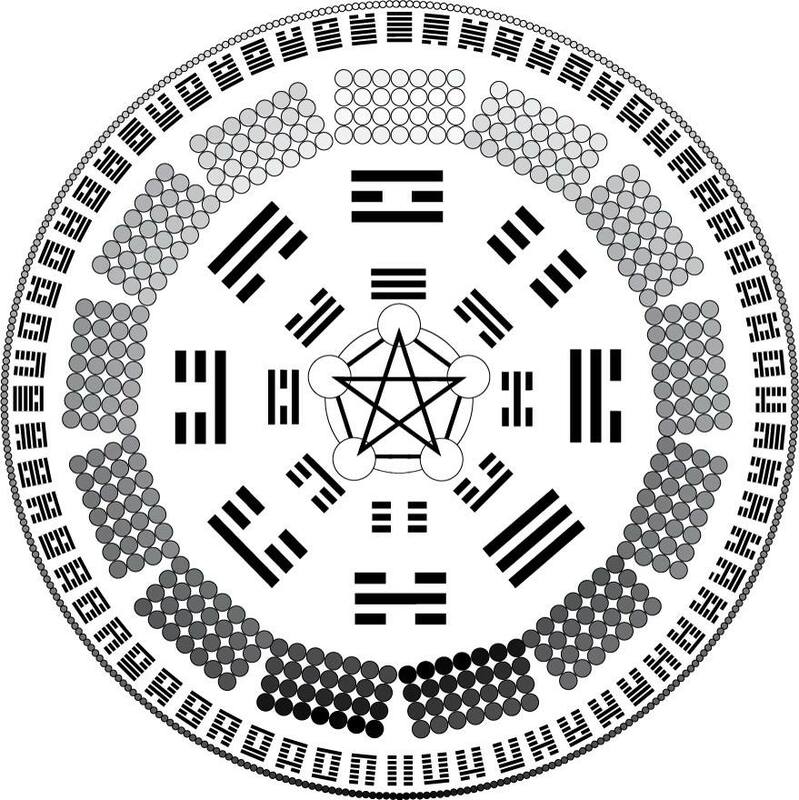 On one side are all the odd-numbered hexagrams, starting with Hexagram #1; on the other the even-numbered hexagrams, starting with Hexagram #2. The curve where the two lines meet is #63 and #64. So if you unfolded that track and made it into a straight line, you'd have #1 and #2 at opposite ends of each other, and #63 and #64 right in the middle of the line. Otherwise you could also envision it as taking the form of a square angle (of 90 degrees, that is, one-fourth of a circle). The Odd numbers would be the vertical and the Even numbers the horizontal. And #63 and #64 would be where they meet, in the center. Look at Hexagram #1 ("Creation"), and you will see that it is all about time. Look at Hexagram #2 ("Passive") and you will see it is all about space. Where they intersect is the Now, but the now is eternal, and instant. It is so fast it cannot be depicted. The moment you say "it is now" you are no longer in the Now. So instead, there is the flickering interplay between that vertical Time and horizontal Space, and it finds itself in the connection between Hexagram #63 ("After Ending") and Hexagram #64 ("Before Ending"): Before Ending, After Ending, Before Ending, After Ending. Everything is a series of immediate flickering moments between what Is Changing and what has Not Yet Changed. Just like Hexagrams #1 and #2 are completely pure in their respective Yang and Yin, as ideal extremes, #63 and #64 are completely mixed; in that messiness of the incipient moment of the Now's explosive crash between Space and Time. #63 has everything in the proper place, #64 has nothing in its proper place. That's Reality. Between Space, Time, and Now there is Space-Time, all the other situations that are represented by all those hexagrams that are in some way derived from these four hexagrams. They each and all have effects on how we can approach Reality and what we must do to manifest Virtue (which also has four aspects). The Superior Individual is he who chooses to take note of each situation as it is really happening in the Now, and manifest the right Virtue accordingly. The Sage is someone who has been able to experience all of Space-Time and how it is both happening at once and not happening at all. The Superior Individual has found the axis which forms a square; the Sage has found the Center-point.